"A German Christmas treat. This recipe was handed down by my great grandmother to my grandmother to my mother." Scald milk. Add sugar, butter, and salt, and cool to lukewarm. Add 2 whole eggs, and 2 yolks. Mix. Add to 3 cups flour and yeast in food processor. Process and let rise until double. Add cardamom, raisins, citron, and cherries, and rest of flour. Process and put on floured board and knead. Let rise in greased bowl. When risen, cut into 3-4 pieces. Roll each into an oval, butter, and fold in half lengthwise. Put on greased baking sheet, cover, and let rise until double. Bake at 375 degrees F (190 degrees C) for 25 minutes. Remove to rack. When cool, frost with white butter frosting and decorate with candied cherry halves and sprinkle with colored sugar. Delight your guests with this spectacular Christmas treat! 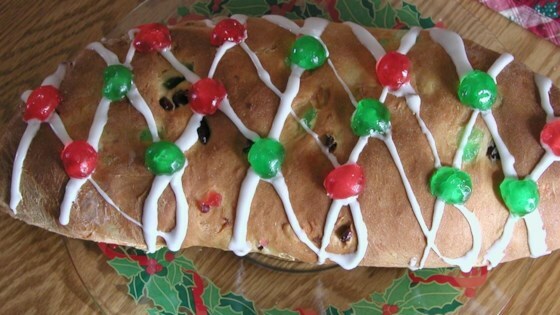 My mom died before she could write down her stollen recipe. It has been over five years since we had it. After making this recipe, it was everything that I remembered hers to be. If you are using quick yeast in the jar the measurement is 2 1/2 tablespoons. Very nice dough.